Updated April 8 @ 1:36 p.m.
Tarleton State University can welcome the new student body president, Colton Sheffield, and vice president, Ashton Mason, for the next fiscal year. This year’s race was not typical, because Sheffield and Mason was the only team running for the position. They both said they have a lot to look forward to this next year. Dr. Mike Leese, Associate Vice President for Student Life and Dean of Students, doesn’t recall this happening before anytime soon, and records only show the outcome of the elections, not how many teams ran. “I don’t know whether this has happened in the past or not, but I have a feeling that it definitely has. I think I can remember it happening when I advised student government in the 1970’s and 1980’s,” said Leese. 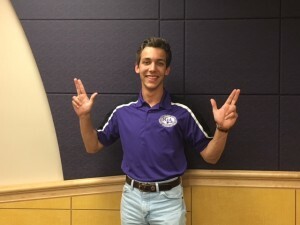 Pictured above is Colton Sheffield, the new student body president at Tarleton State University. Sheffield is a junior working on double majoring in finance and accounting. 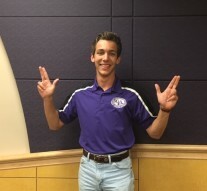 When he isn’t in class, he’s participating in Tarleton Ambassadors and Lambda Chi Alpha events. Sheffield said these organizations have played a huge part on shaping him as a person and helped him get to this position. Sheffield said it is going to be an exciting next year with the Corps of Cadets getting started along with celebrating the Centennial of Tarleton being part of the Texas A&M University System. Sheffield has already started to learn the ropes of his position by talking with previous student body president, Lura Rylant. “Lura and I are working together. She’s giving me the whole run-down on how things work, giving me suggestions or her opinion on things, but not binding at all, just her opinion and told me, ‘Go for it, it’s yours now,’” said Sheffield. The student body vice president, Mason, is a junior studying business administration with a minor in agriculture economics. Mason is a member of Alpha Gamma Delta and has been active in SGA as the senator for the College of Agriculture and Environmental Sciences since her freshman year. She said SGA has given her the opportunity to see things from the other side and allowed her to reach new heights. “I want to give back to the school that has already given so much to me in my short time here,” said Mason. Mason believes she and Sheffield will make a strong team since they are both involved in other organizations, which will help them reach-out to students. Mason said there was no question to agreeing to run with Sheffield. “He has this easy going but hardworking vibe that is very inviting. He has this school’s best interests in his heart, and I know, together, we will do great things for this school. I never dreamed I would be in this position, but having people like Colton Sheffield believing in me and pushing me to my best has already made this experience pretty great,” said Mason.